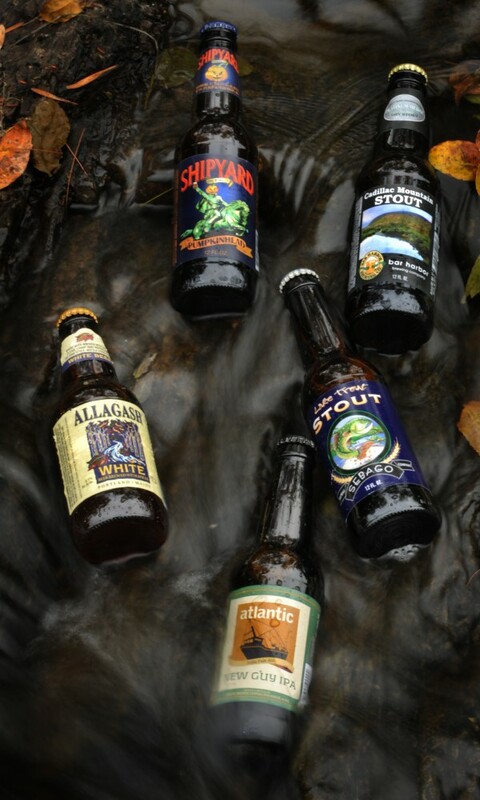 Maine crafted beers photographed in the rushing water of the the Kenduskeag Stream in Bangor on Friday, Sept. 21, 2012. Clockwise from top: Shipyard Brewing Company's Pumpkinhead Ale, Bar Harbor Brewing Company's Cadillac Mountain Stout, Sebago Brewing Company's Lake Trout Stout, Atlantic Brewing Company's New Guy IPA, and Allagash Brewing Company's White. Looking for a sign of an economic recovery from the global recession? If you live in Maine, that sought-after bright spot just might be the light reflecting off a six-pack of local brew in the back of your fridge. Brewing beer for a living in Maine has been an uphill battle for most, if not all, of those who have decided to dive into the ongoing craft brew revolution of the past 30 years. Since the modern beer-making era in Maine began with the founding of the D.L. Geary Brewing Co. in Portland in 1983, several Maine breweries have come and gone, either taking their beers with them or selling off their labels and recipes to a rival. But over the past two years, the industry’s beer stein has definitely been half full, according to statistics compiled by the the Liquor Licensing and Inspection Unit of the Maine Department of Public Safety. From 2009 to 2010, the total output of Maine breweries went up from 4.1 million gallons to 4.9 million gallons, or roughly 20 percent. The following year, from 2010 to 2011, it jumped by another 1.5 million gallons to 6.4 million total, representing an annual increase of 30 percent. That’s an increase of 2.3 million gallons, or 56 percent, over two years. The three years prior, from 2006 through 2009, the total output of Maine breweries increased by less than 12 percent, and that’s including a 3.4 percent decrease from 2007 to 2008. Figures for 2012 are not yet available. Of that 1.5 million gallon statewide increase from 2010 to 2011, Shipyard alone increased its output by more than a million gallons for a total of more than 4 million. Shipyard, Maine’s largest brewery, was founded in 1994 and now distributes its products in 38 states. “It definitely is a huge increase,” Tami Kennedy, Shipyard spokeswoman, said Thursday. Story continues after the interactive map. Click on the beer glasses for more information about each brewery. Other Maine breweries have not had increases a quite as dramatic, but they have been substantial. Allagash Brewing Co., Maine’s second-largest brewer by volume in Maine, increased its production by 42 percent and produced a total of 1,033,000 gallons in 2011. Sebago Brewing Co., the state’s fifth-largest brewer by volume, made nearly 175,000 gallons of beer in 2011, a 20 percent increase over its 2010 output. Baxter Brewing produced no beer in 2010 but, by producing 120,000 gallons in its inaugural year in 2011, it entered the market as Maine’s sixth-largest brewer. At the same time, national brewing companies have seen their sales decline in Maine, according to state statistics. Anheuser-Busch, Miller, Coors and Pabst, each of which sells millions of gallons of beer in Maine each year, all saw their distribution numbers in the state go down from 2010 to 2011. Only three of the top 10 out-of-state brewers who sold the most beer in Maine last year saw their sales increase and two of them — Boston Beer Co. and Long Trail Brewing Co. — are New England brewers rooted in the same craft-beer industry as their Maine competitors. Other recent years show similar declines in Maine for several out-of-state brewers. Kennedy said that this reflects a national trend that shows locally produced beer becoming more popular. Sales by so-called craft breweries — which the Brewers Association trade group defines as any brewery that produces less than roughly 190 million gallons annually — outstripped wine sales in the U.S. for the first time ever last year, she said. Fred Forsley, Shipyard’s president, said Friday that the consuming public’s taste for craft beers — European-style ales, dark brews, seasonal flavors and the like — has only strengthened with time. Today’s new beer drinkers have come of age in an environment where ales, porters and beers flavored with pumpkin or blueberries are commonplace, he said, and so need less convincing to try something new than their parents did. But older drinkers who may have relied upon a standard lager when they were younger also are starting to branch out more, he added. And Shipyard is spreading with those tastes. Growing sales of the company’s flagship Export Ale and its seasonal Pumpkinhead Ale have helped spur Shipyard’s “substantial growth,” Forsley said, while its Peak Organic and Applehead ales also are proving popular. To support that demand, the company recently has opened a small brewery in Winter Park, Fla., and another in Memphis, Tenn.
Atlantic Brewing Co. in Bar Harbor does not have a 50-state strategy — not yet, anyway — but they are growing, according to Barbara Patten, who co-owns the business with her husband, Doug Maffucci. Their output increased by only a few thousand gallons from 2010 to 2011, for a total of around 94,000, but from 2008 to 2009 their production increased by more than 30 percent, from 66,000 gallons to 87,000. She said that besides producing more beer, they have been expanding their reach, too. “They think we’re distributing in California, which we’re not,” she added with a chuckle. Patten said tourists who come to Maine know the state offers a wide variety of locally made beers to enjoy while they are here. And they want to try something new, she added. This puts pressure on craft brewers to constantly come up with new products, Patten said, but the rewards can be significant when something catches on. Atlantic’s Blueberry Ale started out as an experimental batch, she said, and now has been one of the company’s most popular beers for several years. Their New Guy IPA, in its first season as a regular offering, also is high in demand, she said. “That’s how we find [varieties] that become part of the lineup,” she said. And all of it is good for Maine’s economy, according to industry officials. In economic data available online at beerservesamerica.org, The Beer Institute indicates that brewing, marketing and retailing of Maine beer in 2010 supported more than 5,000 jobs and directly generated hundreds of millions of dollars for the state’s economy. Kennedy and Forsley each added that, according to the U.S. Department of Commerce, each full-time job at a Maine brewery supports 2.9 other jobs in the surrounding community. Forsley said the fact that the overall economy, including in Maine, still isn’t doing that great doesn’t worry him too much. A specialty beer that tastes good, he said, usually is a minor luxury that many people are willing to buy. Business Editor Whit Richardson contributed to this article by building the interactive map.